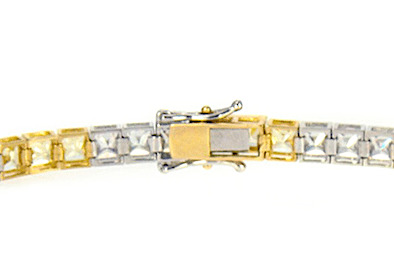 The Delizia Two Tone Alternating Canary Cubic Zirconia Channel Set Princess Cut Tennis Bracelet attractively flaunts a combination of channel set diamond colored princess cut cubic zirconia squares set in 14k white gold that alternate between canary yellow colored princess cut cubic zirconia squares set in 14k yellow gold. Each stone weighs .50 carat or 4mm for a total carat weight of 21 carats of the finest hand cut and hand polished original Russian formula cubic zirconia. 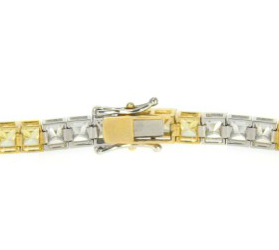 The Delizia Tennis Bracelet features a double hinged safety clasp. This bracelet comes standard in a 7 inch length. For further assistance, please contact us directly at 1-866-942-6663 or visit us via live chat and speak with a knowledgeable representative. All clearance items come with a lifetime warranty on the stones and a one year warranty on the mountings. Please see the policies page for full details.